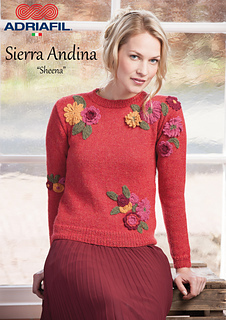 Materials: Adriafil Sierra Andina coral red (16) 8-9-9-10 balls, yellow (26) 1 ball, army green (95) 1 ball, burgundy (21) 1 ball, fuchsia (28) 1 ball, size 3,5 mm (4US-9UK) straight knitting needles and 4 3,5 mm (4US-9UK) double-pointed knitting needles, size 3,5 mm (E4US-9UK) crochet hook. Tension: 22 sts and 30 rows in Stocking st = 10x10 cm (4x4”). Take time to check tension and switch needles if necessary.